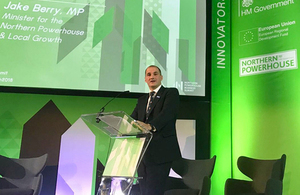 Local Enterprise Partnerships in the North of England will form an influential new body to support the government’s ambitions for the Northern Powerhouse across the region, Northern Powerhouse Minister Jake Berry MP announced today (6 July 2018). "As we approach leaving the European Union we need to ensure that every area of the UK continues to economically flourish. "The Northern Powerhouse will be a vital support to the UK in achieving this and so I am very pleased the 11 LEP Chairs have agreed to form the new NP11 board. "For the first time since 1472, we will bring together the business voices of the Northern Powerhouse in our Council for the North. They have one task: to enrich all the peoples of the North of England – this is the foundation stone of the Northern Powerhouse and, with the skills and expertise of the NP11, we will shift the North’s economy into overdrive. "Together we will deliver a North of England which is an economic powerhouse and one which can proudly take its place on the world stage both now and as we leave the EU." The 3 day summit brought together leading figures from across government and industry including Business Secretary Greg Clark and the Governor of the Bank of England Mark Carney. Both indicated their support for the ambitions of the Northern Powerhouse as they talked about securing a Brexit that supports northern businesses and how innovative small firms in areas like the north east could provide the key to a growing and fairer global economy. "As someone born in the North East, who spent their career in Yorkshire and who has been passionate about the North’s potential as a driving force for national productivity and competitiveness for decades, I am delighted to have been asked to chair this new body. "By bringing together the private and public sectors, local enterprise partnerships are in a unique position to unite northern business and civic leaders behind a common goal of building a true northern economic powerhouse that brings prosperity to everyone who lives and works in the North, while also competing for the country globally. "Our country’s success is built on northern industry, innovation, and determination. As LEP Chairs we have taken important steps in recent years to transform our own regional economies, and now I look forward to working collaboratively with the NP11 Vice-Chair, Christine Gaskell, and the other 9 northern LEP Chairs to achieve extraordinary, sustained growth that we can all share in." "To translate the Northern Powerhouse concept into increasing impact requires new types of conversations across the region and at the heart of this collaboration are common goals which transcend local interests. The NP11 will serve as a strong coherent regional voice with national government about the exciting potential of an innovation-led economy for the North." The 3 day summit is part of the Great Exhibition of the North and is the first event of its kind ever to be held by government. The summit was held on the site of where 19th century engineer Robert Stephenson designed the world’s first locomotive – the Rocket – during the Industrial Revolution. The new board, the NP11 will report on their progress to the Ministry of Housing, Communities and Local Government on a quarterly basis. There are 38 Local Enterprise Partnerships (LEPs) across the country with 11 of these being in the North of England. Please note the Northamptonshire LEP and South East Midlands LEP merged in 2016. In the coalition agreement, the government committed to establishing Local Enterprise Partnerships to replace the Regional Development Agencies. In June 2010 we invited businesses and councils to come together to form LEPs. The local growth white paper, published in October 2010, set out the roles the local enterprise partnerships can play depending on their local priorities. The government’s ambitious, modern Industrial Strategy sets out a long-term plan to boost the productivity and earning power of people throughout the UK. It sets out how we are building a Britain fit for the future – how we will help businesses create better, higher-paying jobs in every part of the UK with investment in the skills, industries and infrastructure of the future.